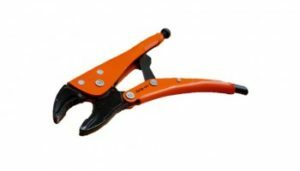 Locking Pliers - Locking Tools - Universal Pliers. Grip-On Tools S.A. If you’re going to own a set of locking pliers (and we strongly suggest you do), the best ones to get are the Grip-On 111-10. 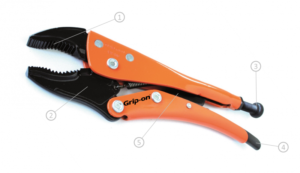 Grip-on manufactures the widest and most modern range of locking pliers & clamps worldwide. Continually producing top quality and innovative tools to meet the growing demand of Welding, Metal Work, Maintenance, Pipe, Auto Mechanics, Auto Body, DIY, Woodwork, Retail and Multi-use. Predator jaws 48-51 HRc Firm gripping, High durability. Ergonomic knob Smooth ajustable jaw opening, with locking nut. Less releasing effort NO-PINCH, QUICK RELEASE Powerful releasing when tools are firmly locked. Self centered rod & lever keeps handles aligned. Ensures years of service. Epoxy resin is 20 times more corrosion resistant than nickel. The spreading of rust is much quicker below nickel plated surfaces than epoxy painted surfaces. An epoxy painted finish provides greater electrical insulation than nickel or chrome plating allowing greater resistance to welding pellets. The qualities of epoxy resin ensure for a better coating in concealed or inner areas. I.e. the “Faraday effect” is minimised compared to nickel or chrome plating. Using epoxy paint helps distinguish the tools on the market place and allows for a customized finish by using corporate colours. A colour painted finish is more visible in the work place. This reduces the incidence of loss and can reduce the risk of injury. 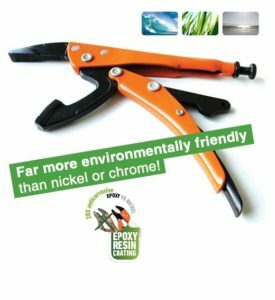 Using epoxy resin in the manufacture of our locking tools is far more environmentally friendly than nickel or chrome. This is in line with the prestigious ISO 14000 which instigates, among other things, the use of non- polluting agents.